A recent trip to Destin, Florida, was a perfect example of why you should consider chartering a private plane for your next business trip. This flight originated in Miami and it’s purpose was to fly three business partners to visit a property they were planning to buy. The property was located in Destin, Florida - a beautiful beach-side city located near Pensacola in Florida’s panhandle. The partners wanted to spend a few hours on the ground visiting the property and then return that afternoon. Flight time from Miami to Destin, Florida in our Cirrus SR22 airplane was about 2:53. Since they wanted to return home the same day, driving (9hrs 30m) or the airlines (7-9hrs total time plus a stop in ATL), wasn’t an option since it would have required them to overnight. They decided to use our private charter plane since it was faster, more convenient, and saved them from spending the night. We departed about 9AM from the Opa Locka Executive airport and arrived in Destin at 11AM local time (Destin is CST and therefore 1hr behind Miami). After arriving at the private terminal Destin Jet, the passengers were off to see their property. The weather was excellent and on arrival they enjoyed the view of the white sandy beaches for which Destin and Florida’s panhandle are known for. We returned to Miami later that afternoon. My passengers were very happy to conclude their business in one day and be home with their families that evening. 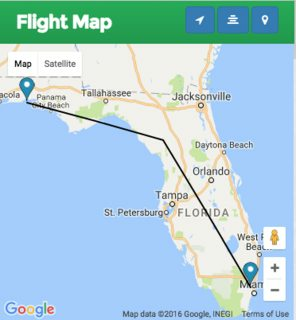 The next time you have a business trip anywhere in Florida or Southeast USA, please consider chartering a plane from us. You will love the convenience and get to spend more time at home. Remember too, you can always check availability, pricing, and book your flight online with our booking app any time.